Security camera manufacturer Bosch has just released the new WZ Series integrated IR bullet and dome security cameras. These cameras have been specifically designed to provide around the clock surveillance in either day or night settings. 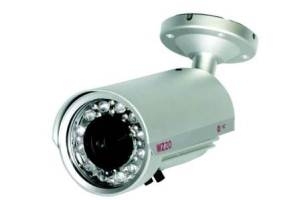 The WZ Series cameras also offer resolutions of up to 540 TVL and night vision recording of up to 150 feet. The active infrared illumination is a very nice feature as well. One good thing about it is that it emits low-noise images at night in order to reduce the video storage requirement on your hard drive. The highest quality camera in the series, the WZ-20, delivers 540 TVL high-resolution imaging as well as a 5 to 50 mm varifocal auto-iris IR-corrected lens. The WZ-18 comes with a 2.8 to 12 mm varifocal auto-iris lens as well as a dual window IR-Cut and IR-Pass filter for exceptional color during daylight hours. Next up is the WZ-16 which includes a 3.8 to 9.5 mm varifocal lens and night vision of up to 66 feet. Finally, we have the WZ-14 which has a 4mm fixed lens as well as infrared capabilities of up to 49 feet. The entire range of the WZ Series integrated IR cameras is designed for both indoor and outdoor use with all cameras coming with an aluminum water-resistant casing. In addition to that, the WZ Series also comes with a whole host of mounting options that allow focus and zoom to be easily adjusted. If you are looking for a high-quality indoor/outdoor bullet or dome camera, then look into the new WZ Series from Bosch, the integrated IR illumination, night vision and around the clock recording are all perfect features for any type of security monitoring situation.